First Language Lessons Level 3 reinforces the grammar and writing concepts introduced in the previous levels. It also introduces new material, including sentence diagramming. Level 3 has two parts: the Instructor Guide and the Student Workbook. This Instructor Guide has the same simple-to-use, scripted format as the previous levels. The accompanying Student Workbook makes it easier for busy parents to spend more time teaching, and less time preparing (you don’t have to hand-draw any diagram frames!). 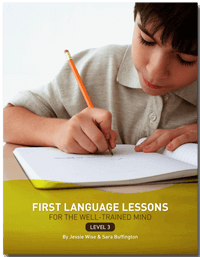 First Language Lessons Level 3 is designed to follow Levels 1 and 2, but can be used as a first grammar text for older students. The optional end-units on writing letters, dictionary skills, and oral usage allow you to tailor the instruction to the needs of your child. If any of you give your children our sentence-diagramming textbooks for Christmas, please get their reactions on video. It will amuse us, and in 20 years it will save their therapists about three sessions’ worth of probing questions. My daughter will be leaving a Classical charter school and will have completed Saxon Phonics 1. Do we start next year with FLL Level 2 or 3 as she will be going into 2nd grade? I noticed on the curriculum map either FLL 2 or FLL 3 may be used for 2nd grade. Thank you! You should start a 2nd grader in First Language Lessons, Level One. Work through that level this year, then skip to level 3 for third grade. This is because levels one and two used to be combined in the same book. We broke them up for consistency and ease of use with our other materials. So, Level Two assumes the student has already gone through level One. Level Three assumes the student has had no previous grammar instruction and thoroughly reviews everything found in Levels One and Two (at a third grade pace) before introducing sentence diagramming. My son is in 4th grade. He has completed FLL 1 and 2 (as of the middle of last school year). He is about halfway through IEW’s Fix-It Grammar, Book 1 (Nose Tree) right now, which he enjoys, but I believe he would benefit from several aspects of FLL and then possibly Grammar for the WTM. Should we jump back in at level 3 or level 4? For a student in this situation, we’d recommend FLL Level 4.
do you use the complete writer series or language lessons – it seems like a lot of material is the same? HELP! These two series (First Language Lessons and Writing With Ease) teach two different subjects (Grammar and Expository Writing), but some of the material does overlap. We encourage you to do both. If you are doing both, then you can skip the material in FLL that covers dictation, copywork, or narration, since the student will get plenty of practice with those skills in Writing With Ease. Thank you for your previous answer about the writing curriculum regarding my 6th grade son. I’m feeling the same struggle in choosing the grammar. Should I simply start with the purple books if his grammar books have not been very well done previously? Or would it be better to do First Language Lessons 3? No need to rush into the intermediate books…he has plenty of time. Take a look at First Language Lessons level 3 or level 4. How many pages are in the Level 3 instructor guide? There are 478 pages in the Level 3 Instructor Text. We have been using Classical Conversation’s Essentials of the English Language for one year and need to slow down and find something else. My son is going in to 6th grade this school year. Which grammar book do you suggest to use? FLL 3, 4 or move on to Rod & Staff per TWTM suggestion? Check out FLL level 4. That may be the best place for a student in this situation to begin. We are printing more copies of this book, and it should be back in stock within two weeks. If you need it sooner than that, it’s also available on Amazon. I am considering using FLL with our oldest student this Fall. She has had some grammar instruction but has not completed all the parts of speech yet. She will be entering 4th grade. I am wondering if we should start in level 4 or should we back up to level 3 and begin here? I have viewed the samples for level 4 and level 3. Level 4 doesn’t appear completely out of her league but I am wondering if level 3 would give extra instruction? Any thoughts would be welcome. Based on this information, we would suggest starting in Level 3. That will ensure that a more firm foundation is laid. There’s no particular need to hurry. She could do Level 3 in her fourth grade year, and Level 4 in her fifth grade year, and be just fine. Is this still the first edition? I purchased the teachers’ book years ago. Will these student workbooks be the right ones? Yes, this is the first edition of the Instructor Guide. Any student workbooks for FLL level 3 that you purchase will match with this Instructor Guide. There haven’t been any changes.